Physiotherapy is the therapeutic application of agents to induce a physiological response in the body, it enhances or supports the chiropractic adjustment in an effort to normalize the body's natural processes and to halt and reverse tissue disease. 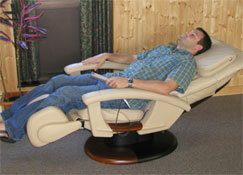 Motorized massage chairs and spinolator tables that loosens adhesions and maintains ligament and muscle tone. Typically for 15 minutes. Intersegmental traction therapy helps increase and restore elasticity and motion to the spine which improves the circulation of spinal fluids and increases blood flow and oxygen to the discs, ligaments and muscles. The chairs have roller type cams that gently travel the length of the spine stretching, percussing and massaging the spine and stretching ligaments and muscles while the patient is comfortable and relaxed. 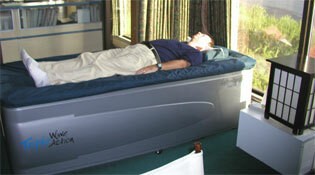 The result is improved balance, strength, mobility and a relaxed patient. Dry water massage system provides a warm (96 degrees F.) bed of adjustable massaging high powered jets that provide a full-body, soothing massage relieving muscle tension, aches and stress. Research studies have documented the physical, mental and emotional benefits of levels and metabolism, reducing blood pressure and increasing lymphatic drainage.